While preparing for an upcoming trip to warmer weather, I started the way I always start a trip: with a packing list a mile long. I have these grandiose ideas of these super stylish outfits but over several trips to the beach I've learned these plans don't transition to reality well. After a day in the sun, whether at the beach, the pool, or off on an exploration adventure, I like to wind down with a shower and dress comfortably for a dinner out. This outfit is definitely too "cooler climate" for a beach vacation, but this is definitely my idea of the perfect travel outfit, whether flying or roadtripping. The layering allows for temperature flux, the shoes are perfect for easy on/off, and of course the leggings are a no-brainer choice. I also love the stack of bracelets because they give a little personality but are pretty low maintenance. If an arm party isn't your thing, even one of these beauties would add a little *ahem necessary sparkle. A traveling adventure isn't the only occasion for a look like this though; I think this is the perfect casual ensemble for a daily spring aesthetic! I must admit, I just ready for sandals, but we have awhile before I can bare my tootsies. 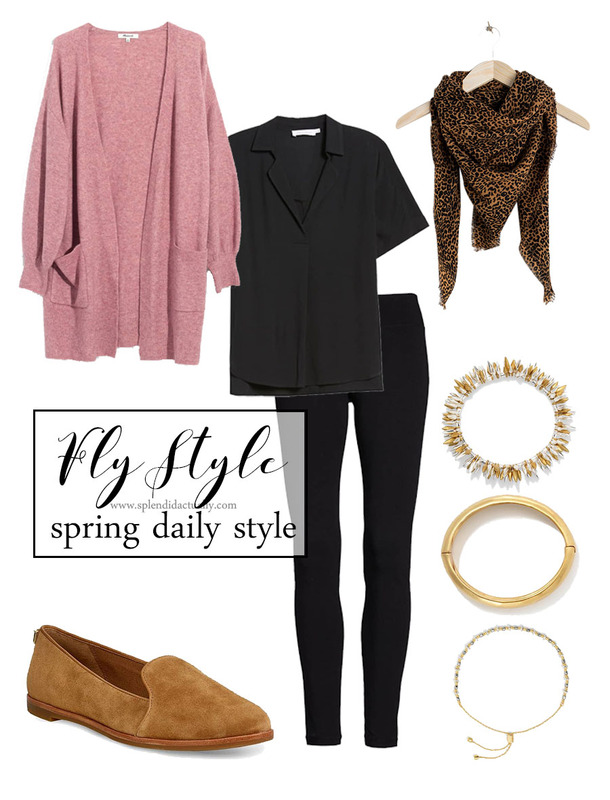 Do you have a spring uniform? What is your must have for the pending warmer temperatures? !